*This post contains affiliate links. All opinions are 100% mine. A couple months ago, I redecorated our bedroom while my hubby was away for therapy. If you missed the post Distressed Vertical Pallet Wall, please check it out. It’s one of my favorite projects to date. One important feature of the new design was to hang the tv on the wall. It not only saves space in the room but it eliminates a tv stand. The tv stand we currently used wasn’t something I liked or valued. So eliminating it was an easy separation. I purchased a tv mount kit and hung the tv on the wall. But, that left the tv cable box hanging along with all of the crazy cords. 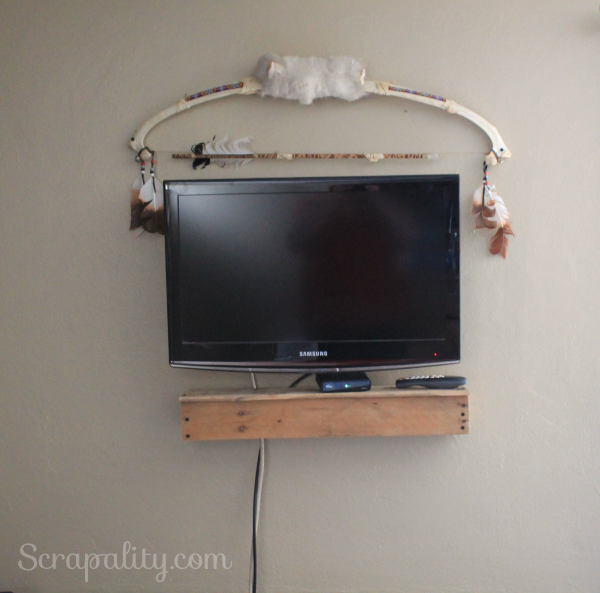 When I remodeled the living room I mounted the tv on the wall and tucked the cords inside the wall. But, in the bedroom I didn’t want to punch holes in the wall. I had to come up with a different plan. 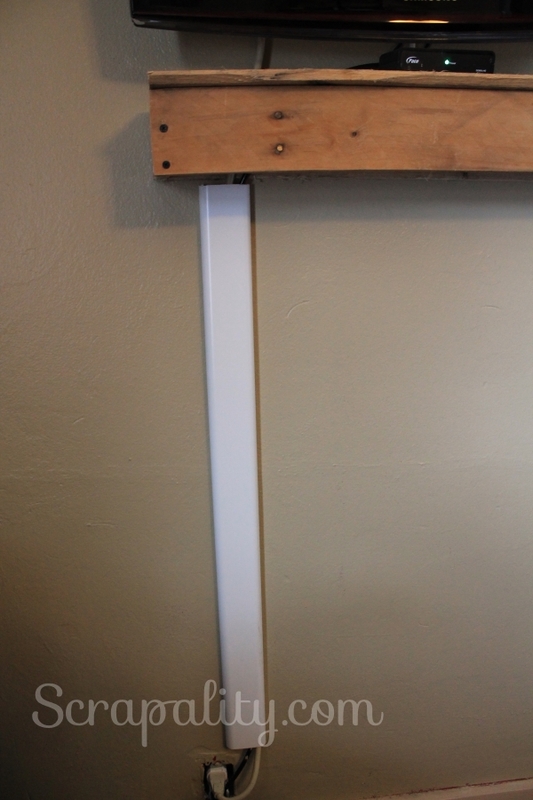 To fix the hanging cable box, I built a floating shelf using pallet wood. I used a couple pallet boards to frame the box leaving the bottom open for the cords to drop through. I screwed the backside of the frame into the stud in the wall. Then attached a board the same length on top of the frame. Hanging cable box problem solved! I purchased a tv cord kit from Home Depot to cover the cords. If you would like to view or pick up the product click on the link above. The instructions were simple to follow and only took a couple minutes to install the cord cover. The tv cable cord cover is paintable making it even easier to blend into the background. Just paint the cover to match the wall. It’s sure beats the cords hanging, doesn’t it? 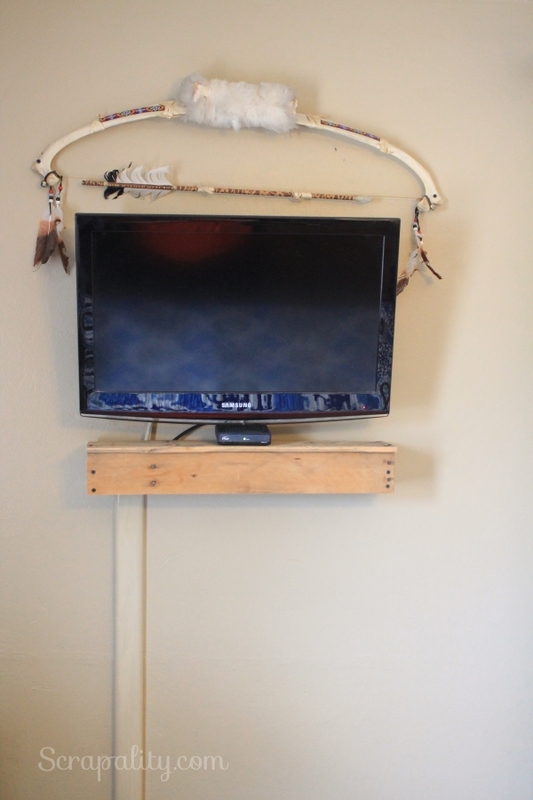 The tv mount is fully adjustable. I allowed for extra room for the cords to move freely behind the tv when adjusting the tv. When the tv is place back to home position everything is nice and neatly tucked away. So far we’ve enjoyed the mounted tv and we don’t miss the tv stand one bit. Don’t forget to stop by this Saturday for Scraptastic Saturdays starting at 8AM Est. Hope to see you then! 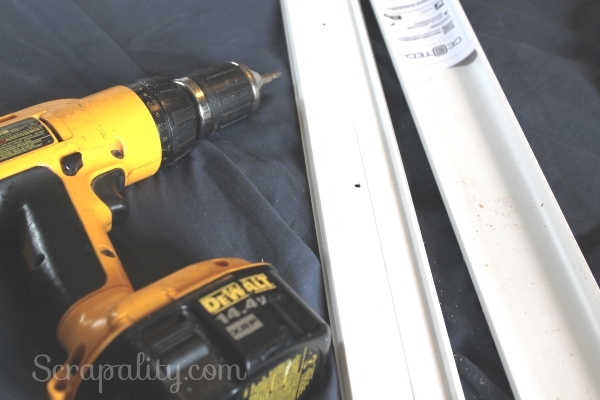 This post is shared with a few amazing linky parties. Another great pallet project! Love it! I love that shelf. It looks awesome. Cool idea. What a cute and cleaver idea! 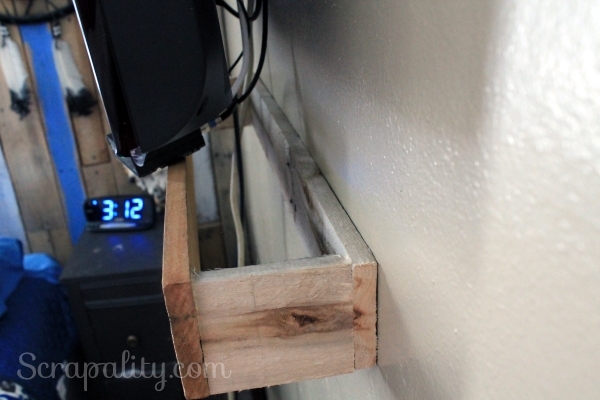 I love the idea of a floating shelf for the cable box! We would love for you to share with us over at Party in Your PJs, our weekly link party. Very nice! I like how you hid the cords because not everyone can punch holes in the walls either. Thanks for sharing on Merry Monday! The whole set up is very clever! Thanks for sharing with SYC.